Every magazine recently has been sharing their favourite hair and beauty products of 2013, so when I was cleaning out my bedroom I choose all my favourite products to go into the one box. Thats when I came up with the idea of creating my own product awards but on my blog. Every week I will be sharing my favourite products from different categories. Today I'm going to be taking about my must have skin care products. 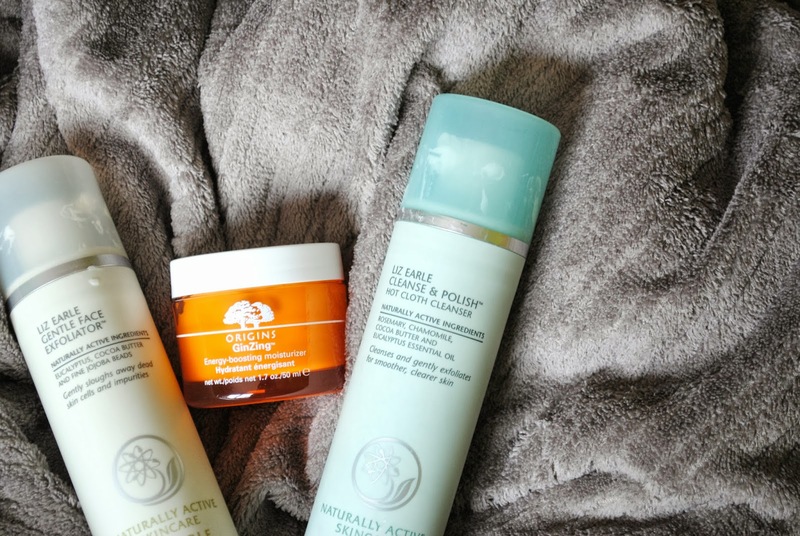 As many of you may know I don't have a skincare routine because to be blunt I 'm too lazy but when I fancy it I will always go back to the same three products which are the Liz Earle Cleanse and Polish , Origins Gin-zing Moisturiser and the Liz Earle Gentle Face Exfoliator. I tend to use these products as one so I will usually start with the cleanse and polish , exfoliator and the moisturiser to follow. Every blogger of any kind has reviewed or featured this little bottle of magic. The product is a thick , creamy cleanser that is applied to a dry face to blemish spots, redness and every other skin problem you may face. I love to apply this after I have been wearing make up to refresh my skin and to remove any make up left behind. This has to be the best exfoliator every invented. The small grits get rid of pores without making your face painful and dry. I often use this after I have cleansed my face to make my skin look that extra bit more loved. This is a recent addition to my skin care must haves, the Origins budget buy product. The gin-zing moisturiser is a gel like consistency that feels light, cooling and moisturising on the face. Not only does this moisturiser look good it smell amazing and defiantly does wake you up on a morning where you're not feeling too awake! What are your skincare must haves ? Already a mahoosive Liz Earle fan and I've walked past the GinZing product a few times. I think next time I will possibly, maybe have to make a purchase. Would you say it's suitable to use as an everyday moisturiser?